Rev. Parnell Smith Sr. is a born again, baptized, Holy Spirit filled believer of Jesus Christ. Called, anointed, and appointed by God to preach and teach the Gospel of Jesus, our Lord and Savior. Pastor Smith is a unique soldier in the Lord’s Army that is committed to empowering and equipping the people by sharing the Gospel throughout the world. “Decent and in order” is the only approach our pastor knows. The Lord has allowed him to be crafted in the Word and theology, while simultaneously developing 28 years of managerial skills within the health care service sector. Pastors Smith’s unique abilities and experiences along with an infectious spirit to serve, give, and build the Kingdom of God has been a tremendous blessing to New Bethel Missionary Baptist Church. Pastor Smith is the husband of one wife. He has been happily married to Donna since November of 1986. They are the proud parents of Parnell Jr., Danielle, and Alexis. Pastor Smith has three grandchildren: Keylee, Ezra and Aiden. 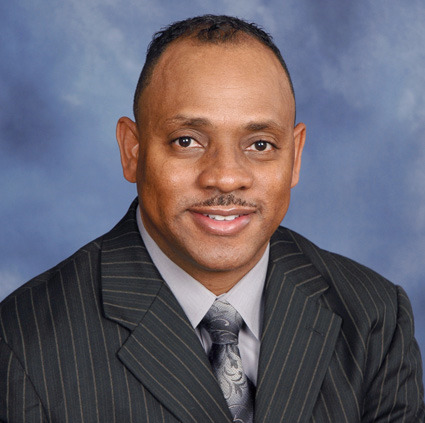 Pastor Smith was born and raised in Birmingham, Alabama. He received his education in the Birmingham City School System and he attended Southern Technical College where he received an Associates Degree in Computer Science. He currently holds a Bachelor’s of Arts Degree in Pastoral Christian Education from Birmingham-Easonian Baptist Bible College. While faithfully serving at Mt. Joy Baptist Church in Trussville, Alabama Pastor Smith was called to Pastor First Missionary Baptist Church in Moody, Alabama in January, 2000 where he served until January 2005. In February 2005 he was called to Pastor New Bethel Missionary Baptist Church in Panama City Florida. Pastor Smith and the New Bethel Missionary Baptist Church family are still praising God for this holy union. New Bethel Missionary Baptist Church is growing spiritually, mentally, and physically. Under the leadership of Pastor Smith New Bethel has grown from 20 plus members to over 400 plus. Pastor Smith has established and expanded ministries to meet the needs of the congregation and community, and continues to emphasize the empowering and equipping of our youth. Under the vision and direction of Pastor Smith the New Bethel Academy (NBA) was established to provide strong Christ Centered academic foundations to children from infancy to preschool. New Bethel continues to grow and bear good fruit under the leadership of Pastor Parnell Smith, Sr., but eyes have not seen; ears have not heard; nor has it entered into the heart of man the things which God has prepared for those who love Him. Pastor Smith serves the community in several ways including service on the ELC Early Learning Coalition board of directors, ABC Alignment Bay County operating board and Volunteer Chaplain for Bay County Sheriff's Office.